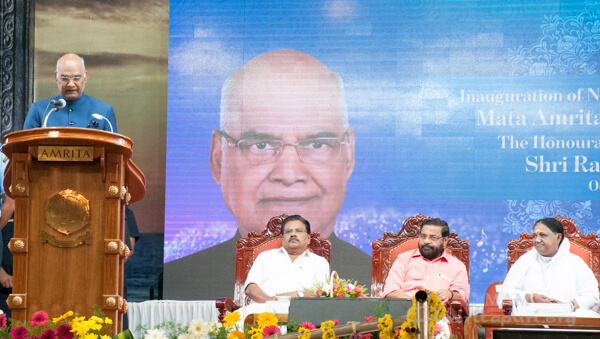 8 October 2017 — Kollam, Kerala: At a function held today at Mata Amritanandamayi Math in Kollam, Honourable President Shri Ram Nath Kovind launched a new charitable initiative through which the Math aims to provide filtration for clean drinking water to one crore [10 million] villagers throughout the nation. 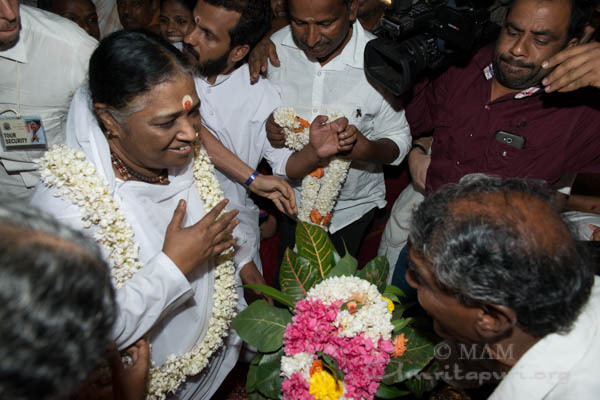 The initiative was inaugurated in the presence of Amma. Speaking on the occasion of inaugurating the project, the President referring to Kerala’s role as one of the leading spiritual homes of India, said “Mata Amritanandamayi represents this enlightened spiritual tradition of Kerala. 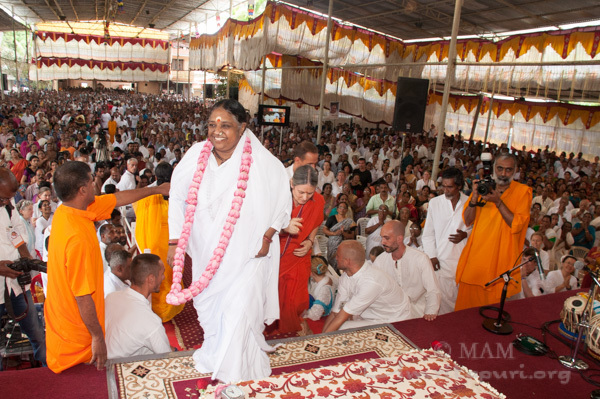 Like Adi Shankara or Ayyankali, Amma sees her spiritual mission as a contribution to nation building. 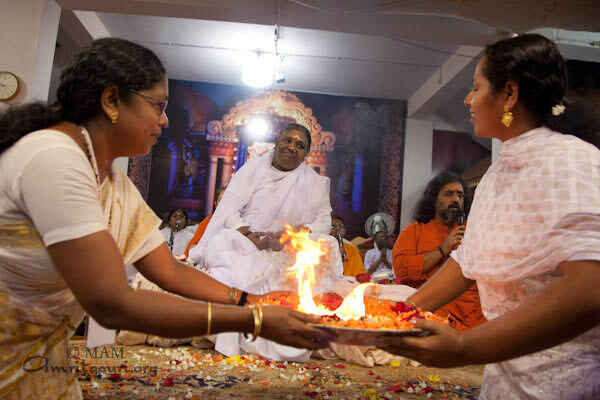 She recognises, as only the truly spiritual can, that the greatest service to the Divine is service to fellow human beings. 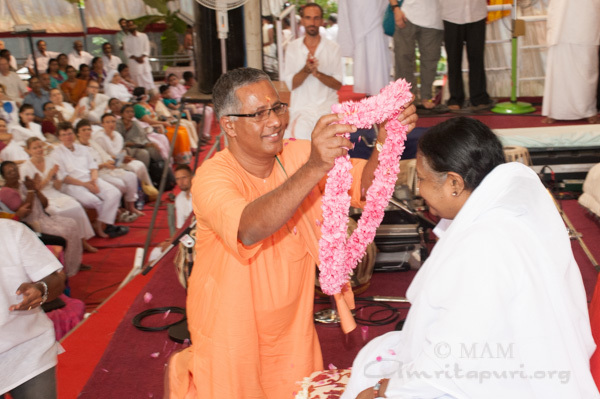 Amma drove directly to the Tanur ashram from Kozhikode program. 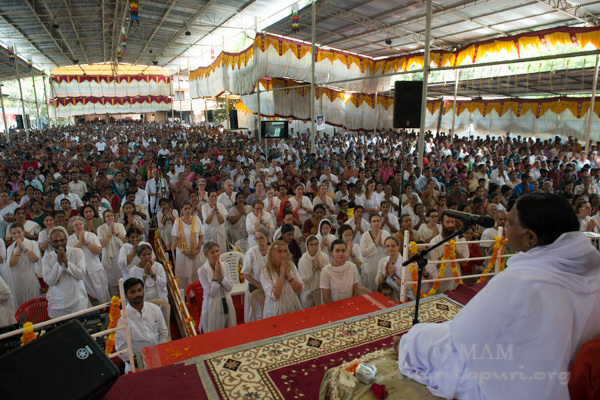 The ashram is situated in an idyllic spot in the countryside where cows are raised. 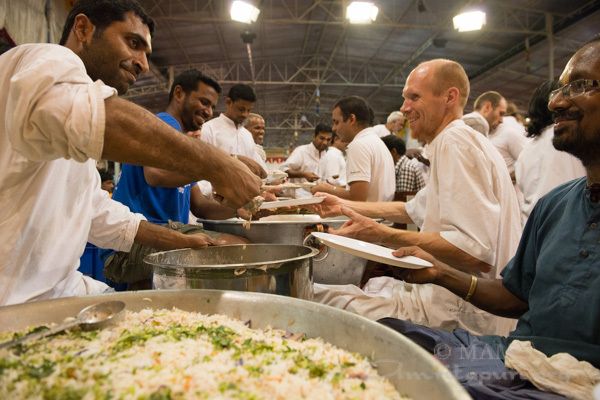 The devotees enthusiastically joined in to serve the prasad with Amma. 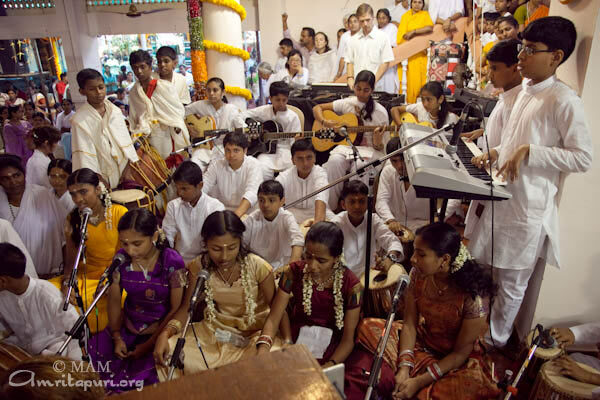 Amma sang bhajans with them, one of which has a traditional style; “Elo, Elo.” The devotees, smiling ear to ear, clapped and danced along. 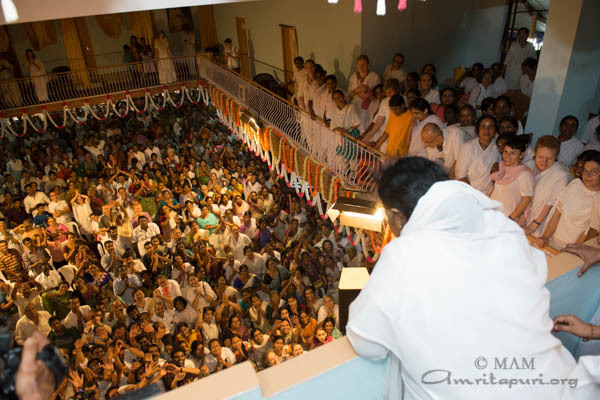 This is Amma’s second visit to Tanur, the program held at the Amrita Vidyalayam compound. 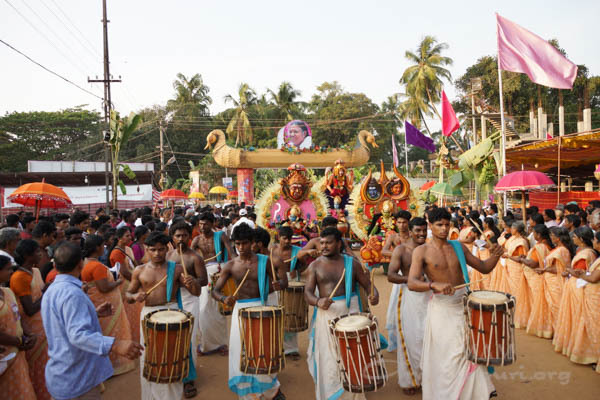 It is traditional to hold a procession as part of a religious festival and the devotees dressed as gods and godesses paraded through the town in honor of Amma’s visit. 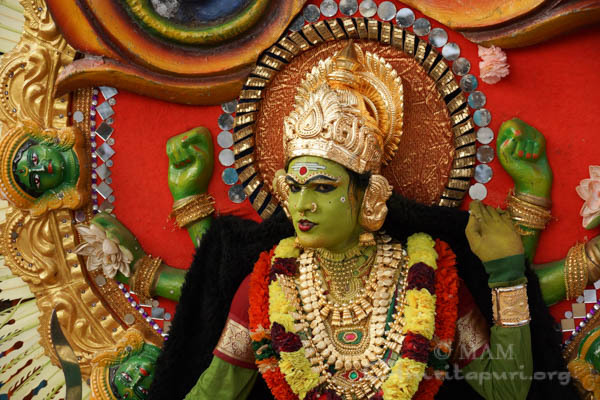 The costumes employed a folk art style, Teyyam, wherein the participants make their faces and body up and also hold a painted wooden background. 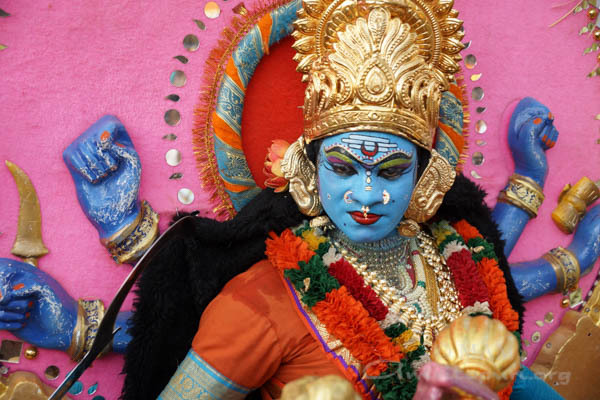 The end result was a very convincing Shiva, Vishnu, and Devi. 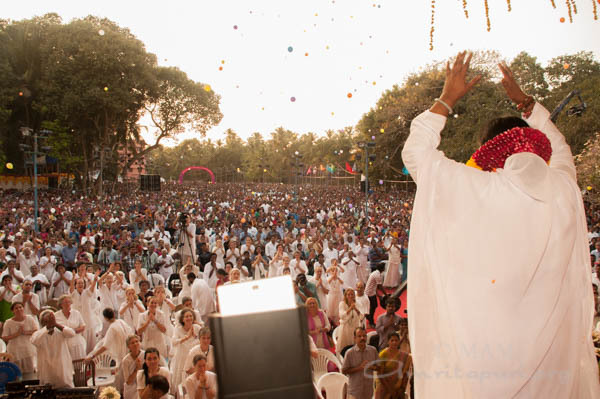 Fireworks were set off and hundreds of devotees holding balloons released them into the air as Amma arrived on the stage. 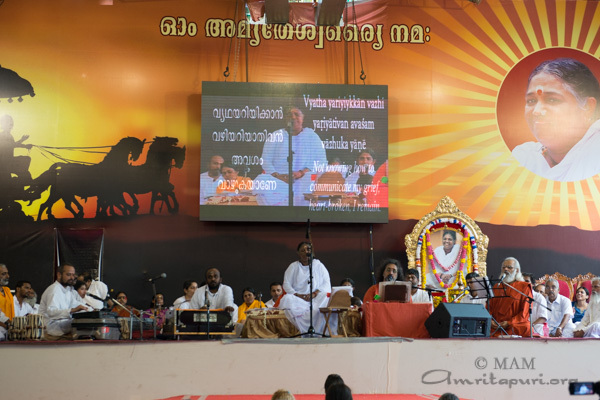 Amma was welcomed onto the stage by the minister Anil Kumar, the local MLA Abdurahman Randathani and the famous chenda (drum) player, Mattannoor Shankara Kutty. 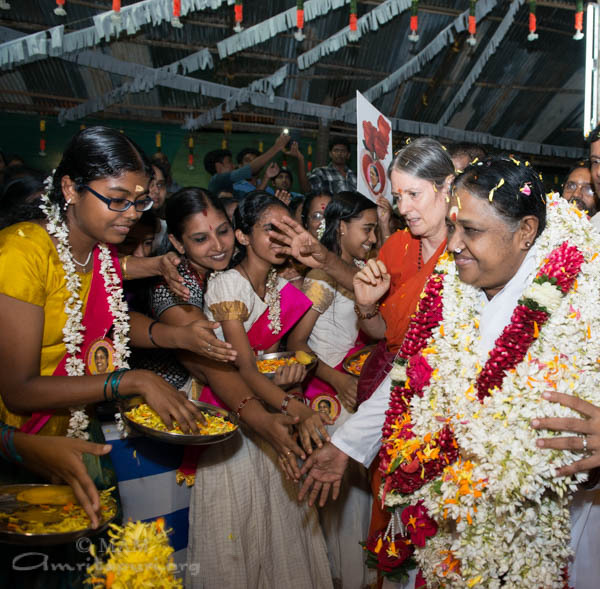 Amma offered lifelong pensions to poor women, and Vidyamritam scholarships for poor children. 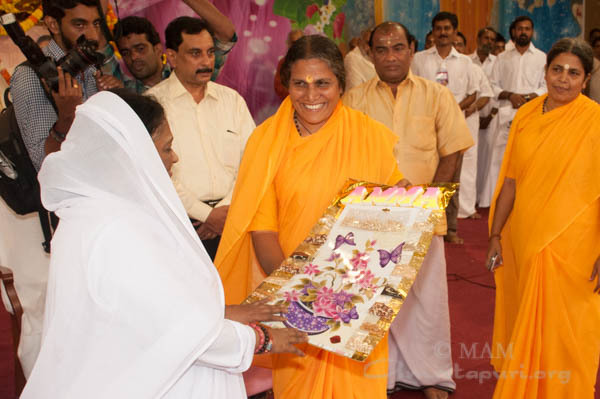 She also distributed vegetable seeds to encourage devotees to grow their own organic food. 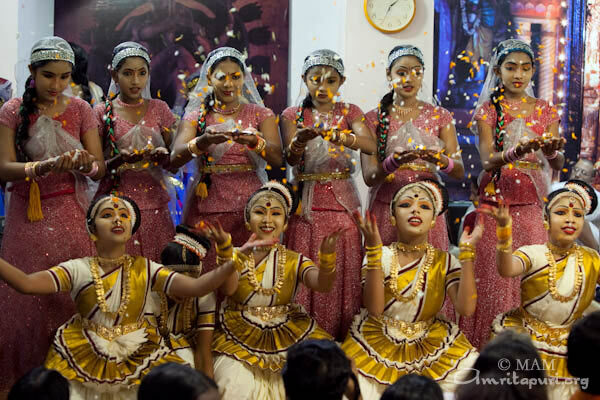 Throughout the programme, students from different Amrita Vidyalayam schools presented cultural programs of dance, music and drama. 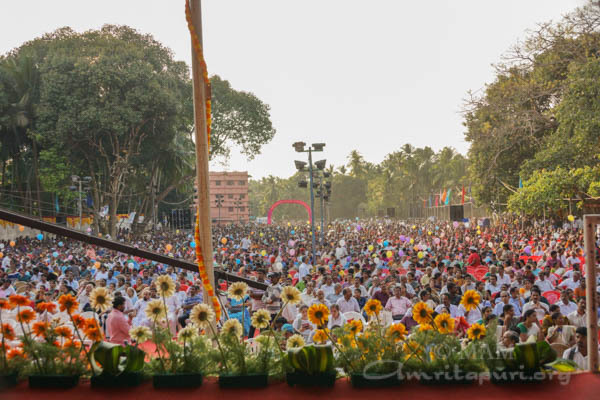 Even though Amma would arrive only at 6:00 in the evening, thousands had already arrived before 2:00 pm. 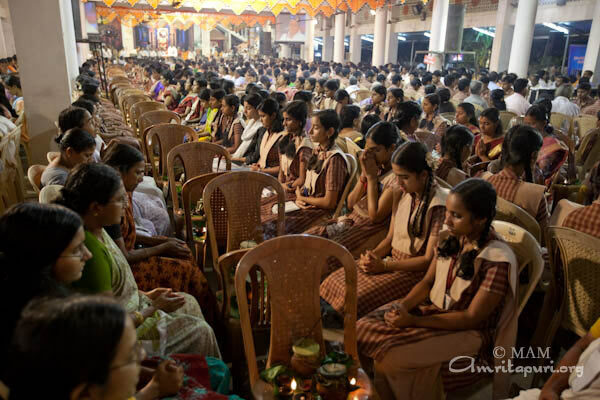 They sat in their seats throughout the night, quietly and patiently waiting for their turn to receive Amma’s darshan. 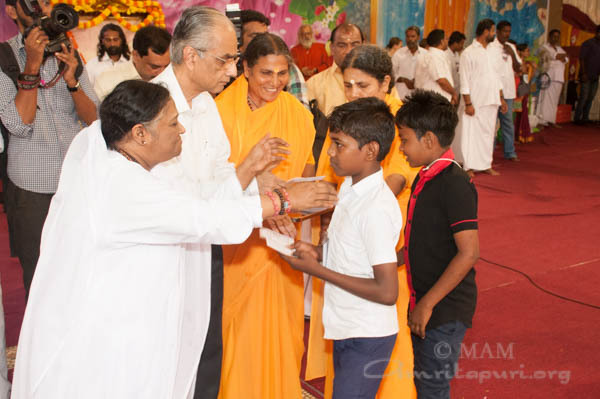 It was noteworthy that all the students from the area had major exams on the following day. Usually parents will never take their children out the day before an exam, to avoid the children being tired and not being able to perform at their best. 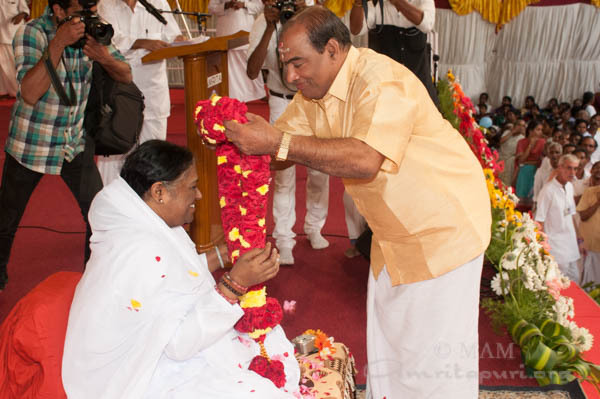 But the opposite was true at Amma’s program that day. 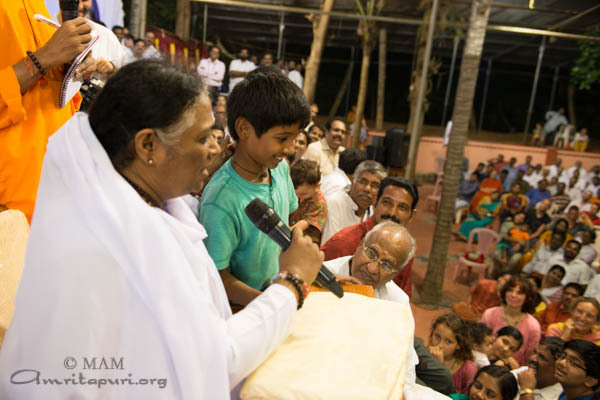 Children and their parents would not miss Amma’s darshan and they came despite the exams the next day. 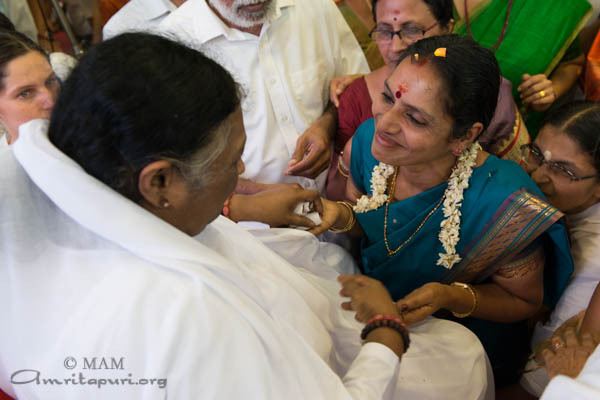 Amma gave each child during their darshan a chocolate heart. 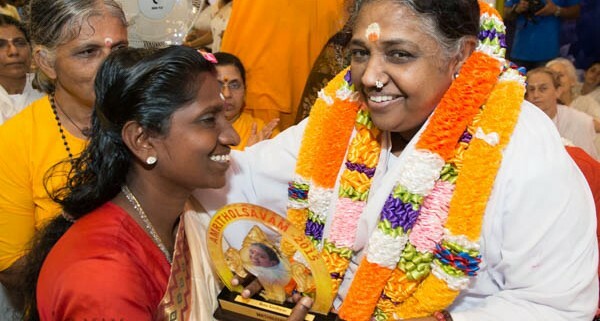 It was highly unusual that Amma gives out chocolate hearts to so many, and in fact they ran out of the chocolate prasad! 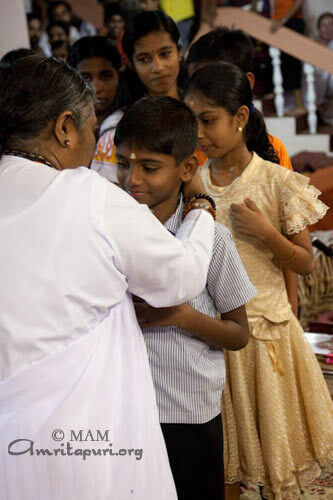 Many children asked for Amma’s blessings for their studies, and one could be sure that Amma blessed each of the children’s efforts and aspirations. 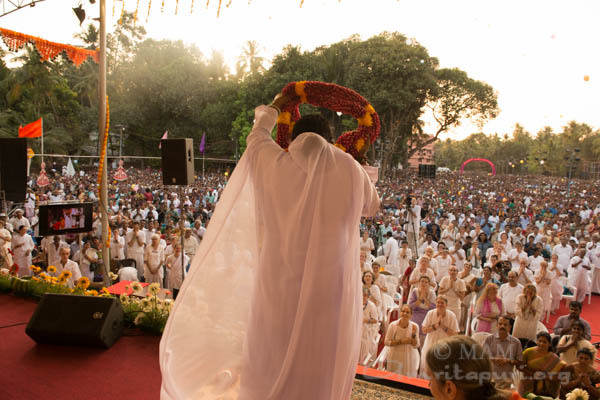 It was a beautiful conclusion to Amma’s Tanur program. After nearly 16 hrs being continuously on the stage, when she left, she had painted the hearts of all those who came with Love. 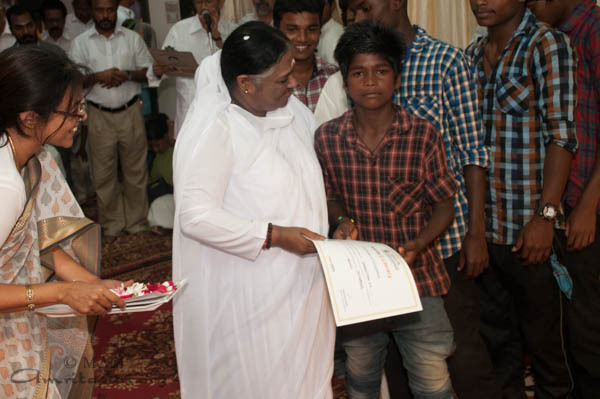 During Kozhikode program, Amma distributed Amrita University’s certificates to 17 tribal children from Attapadi for completing the eLiteracy & Health Awareness course. The tablet computers were taken to their doorsteps and classes timed after their working hours. 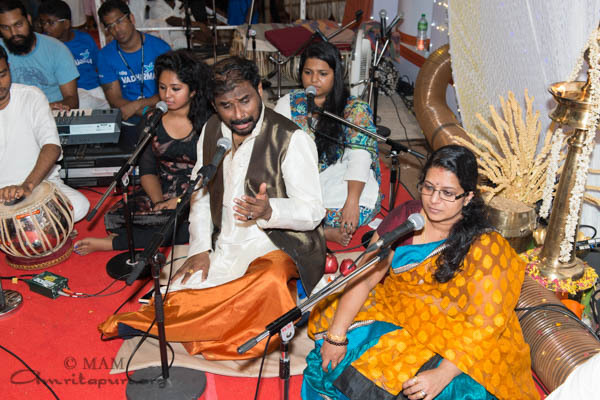 The tutor Aneesh is an alumni of Amma’s Parapally School. 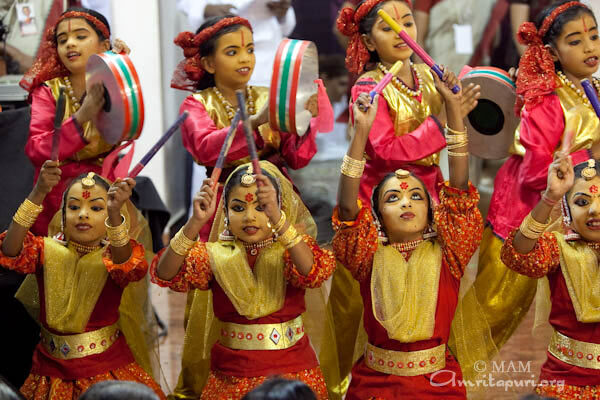 Amrita CREATE is training 1000 tribal children and adults in Kerala. Tablet computers are used to teach Computer Concepts, health awareness, social awareness and value education. Selected student ambassadors help raise health and social awareness in the entire village and school. The beneficiaries include tribal students in schools and from Mahila Shikshan Kendras, where tribal girls are brought in for equivalent education. 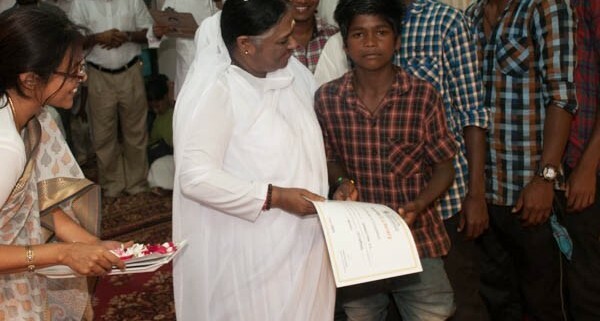 It also includes girls from the Nirbhaya Hostel, who have been saved from trafficking and molestation. 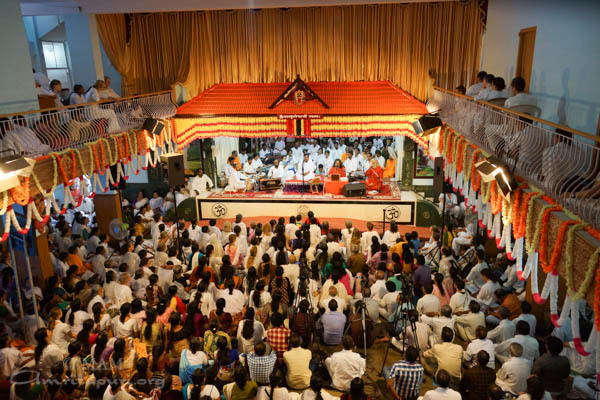 Hundreds of the Kozhikode devotees were lined up holding brass trays of flowers and puja lamps when the tour group arrived at the ashram at 5:30 in the evening. 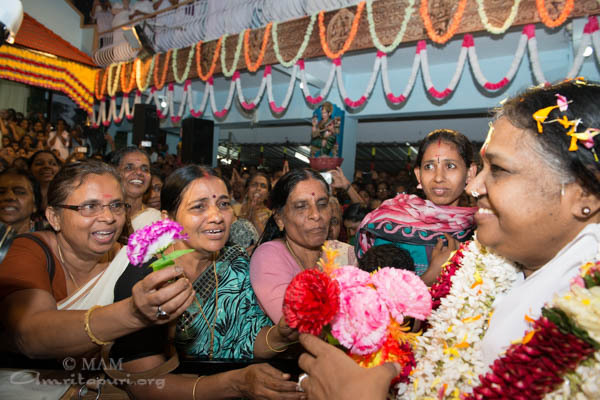 Amma was not expected to arrive until 7:30 pm. 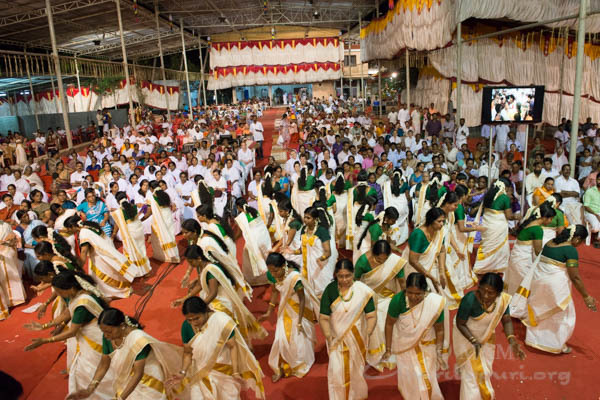 The Kozhikode devotees who were lined up five or six deep, along the path to the stage were not deterred by the long wait. 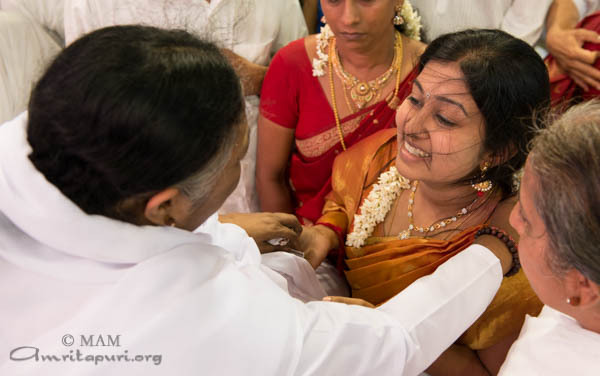 They were fixed to their spot, anticipating the happy moment on Amma’s arrival they would be able to catch their first glimpse of Amma. 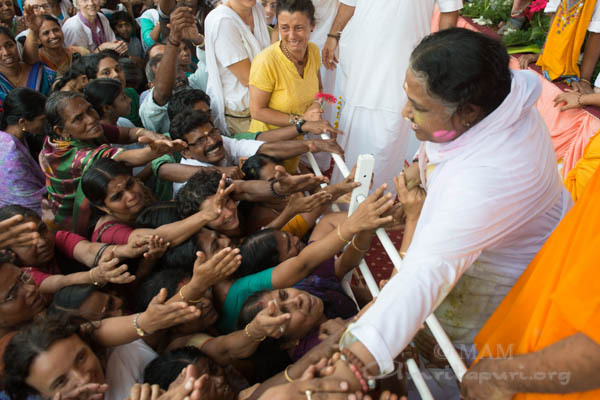 As word of Amma’s car approaching the chanting of “Om Amriteswaryai Namah” by the devotees reached a fevered pitch as Amma stepped out of the car. 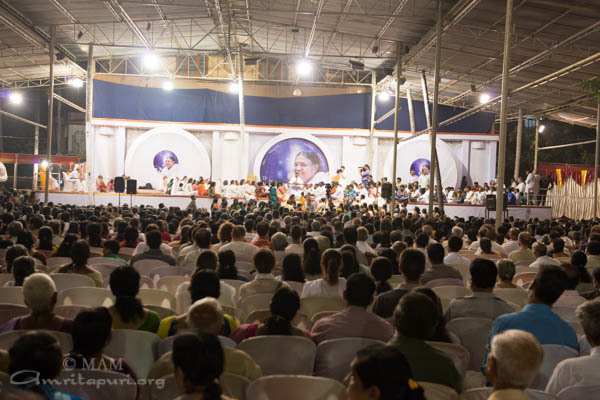 Amma went to sit directly on the small stage, where she began to sing bhajans followed by meditation. 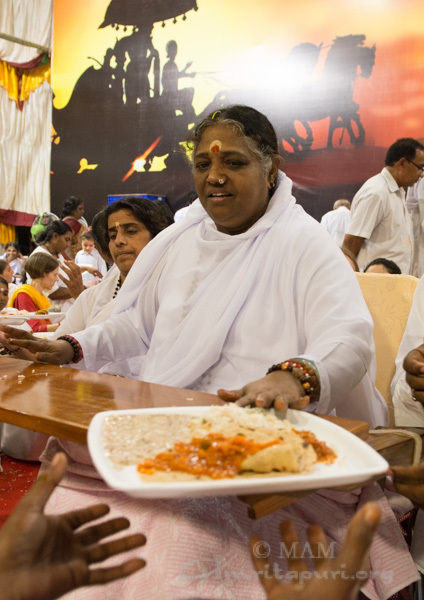 She then distributed prasad plates to one and all, smiling at all sitting before her. 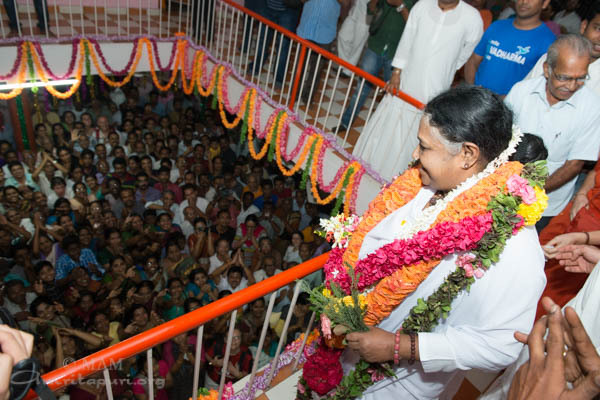 It was past 9:30 pm when Amma climbed the steps to her room. She looked through the curtains from the balcony overlooking the hall and smiled beatifically at the devotees down below. 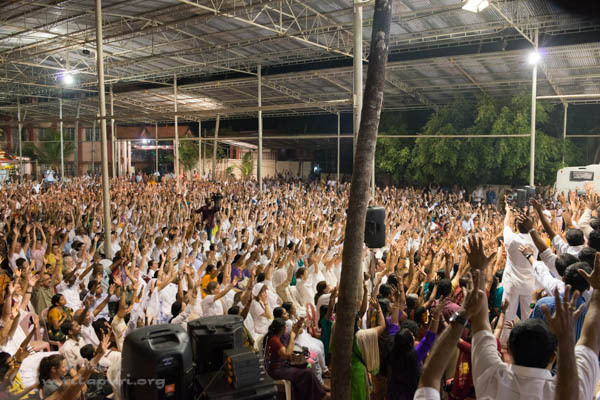 The devotees swayed to and fro as one, with hands pressed together in prayer, gazing up at Amma, calling her name. 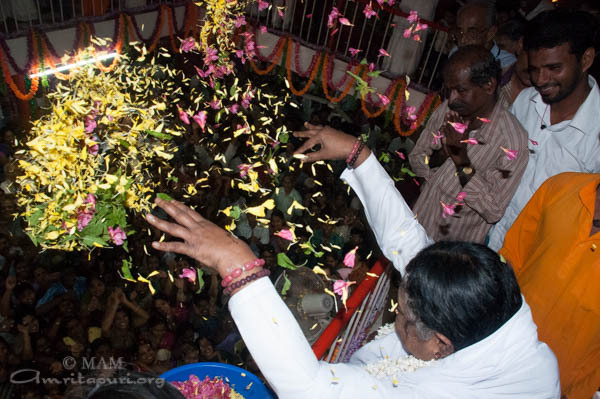 Amma threw flowers petals down and the devotees’ arms outstretched to catch the blessed petals. 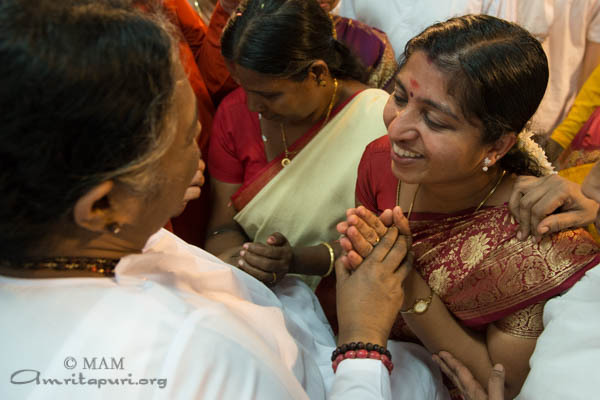 Amma stretched her arms as if to embrace the whole group and brought her hands to Her heart; as if sweeping all the devotees to reside in her Infinite love. 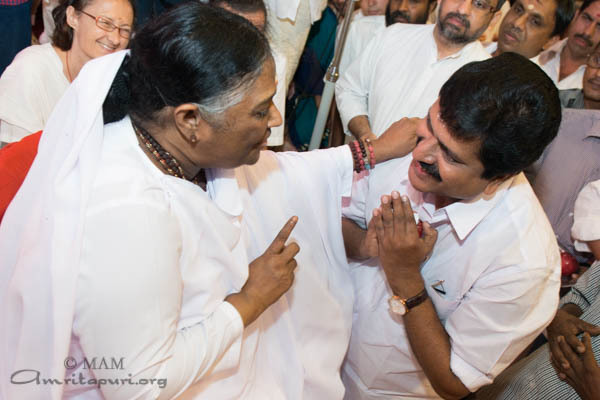 Among the distinguished guests the following day who came to welcome Amma were the king of Kozhikode, Samutiri Raja, and the renowned Malayalam writer, P. Valsala. 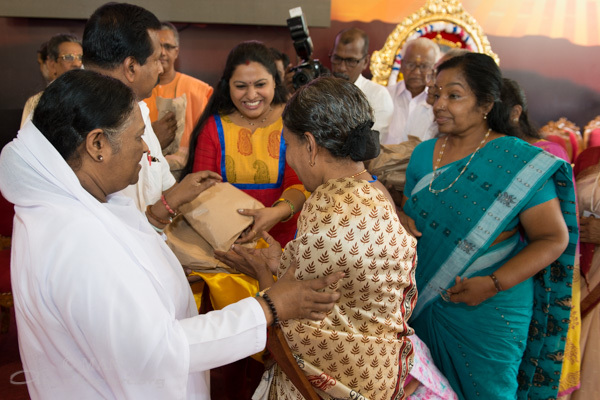 Amma distributed vegetable seeds to emphasize the importance of cultivating personal organic vegetable gardens. 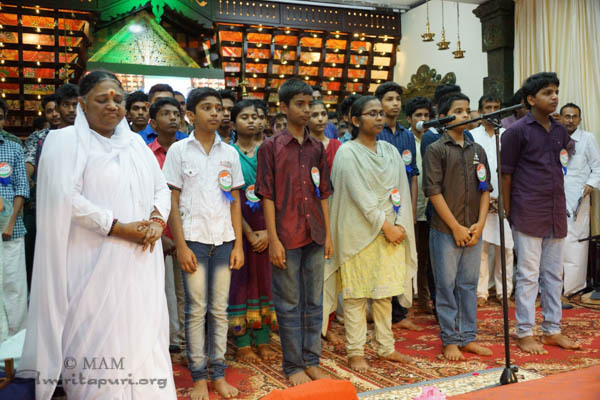 Amma expressed that she was very happy to see Amrita Vidyalayam students bringing produce they had grown in their schools. 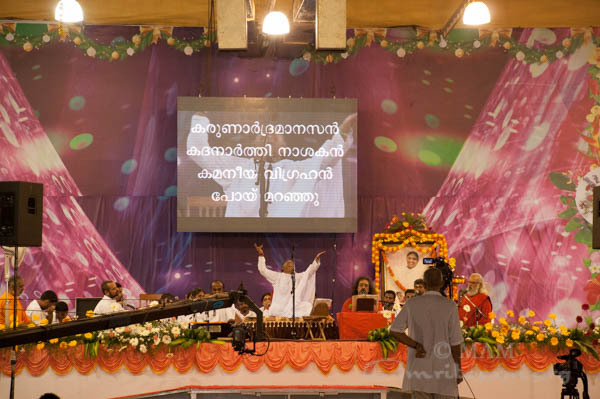 A group of youths from neighboring villages stood with Amma on the stage and recited a pledge promising to never drink alcohol or take any intoxicants, and to make their village alcohol-free. 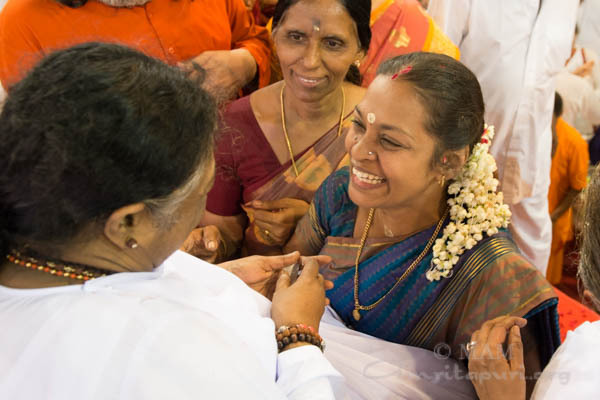 Amma also received another very special guest: a Guinness Book of World’s Records record holder for being the world’s smallest cow, Manikyam was brought for Amma’s darshan. Manikyam is a Vechoor cow, an endangered breed native to Kerala. 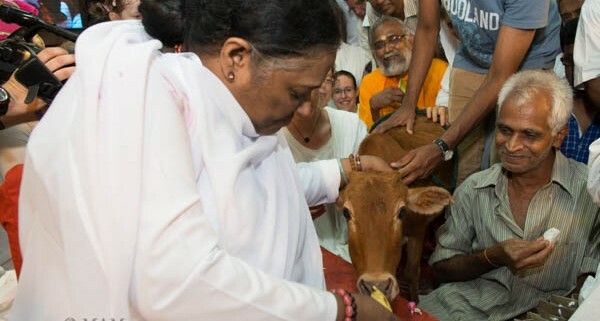 Amma playfully held out a banana in front of Manikyam and as she tried to bite the banana, Amma held it just a little further away so the cow had to reach again and again. 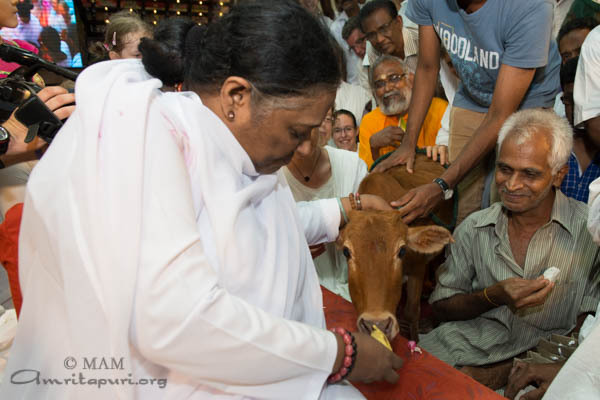 For several years, Amma has been encouraging the protection of the Vechoor and other endangered breeds of cows by having them bred and raised in Amritapuri. 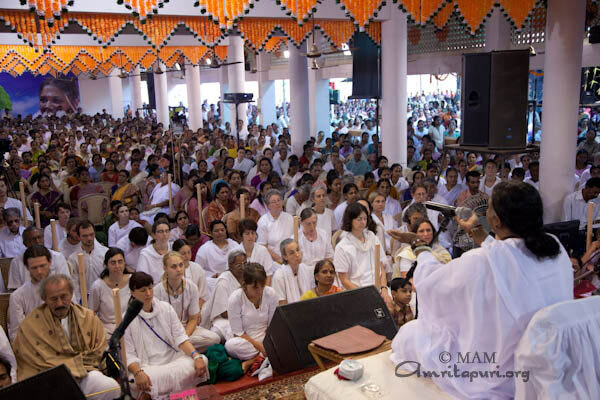 At the end of darshan Amma sang the new bhajan ‘Mariyamma’. 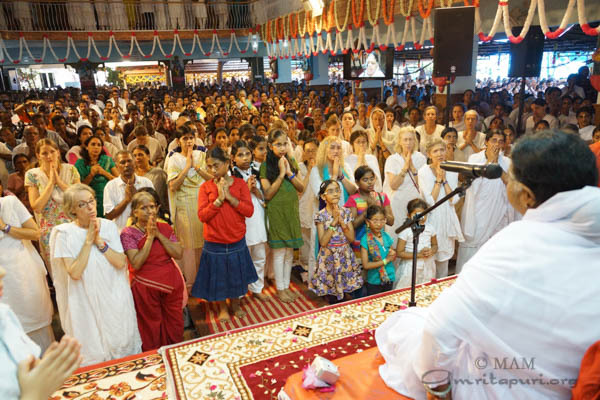 The devotees poured their hearts out to Amma in this bhakti packed call and response bhajan. 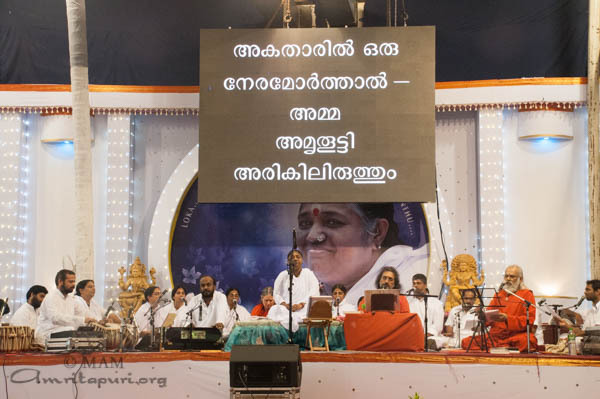 Amma held the first program of her 2015 North Indian Tour in the ancient town of Kodungalloor. 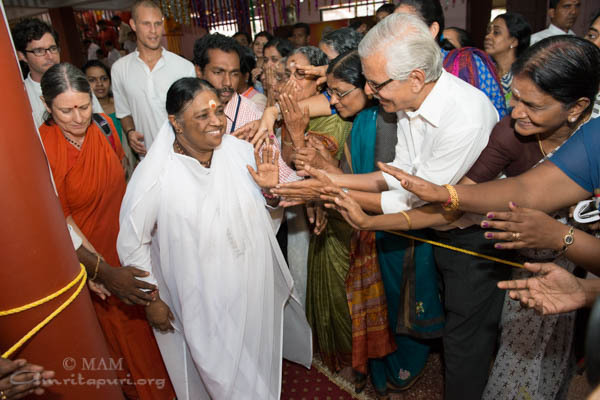 Here the first Bramasthanam Temple was consecrated, as well as the first Amrita Vidyalayam, Amma’s primary and secondary school. The design of the Bramasthanam temple here is unique as it is the only one with a stupa, or flag post. 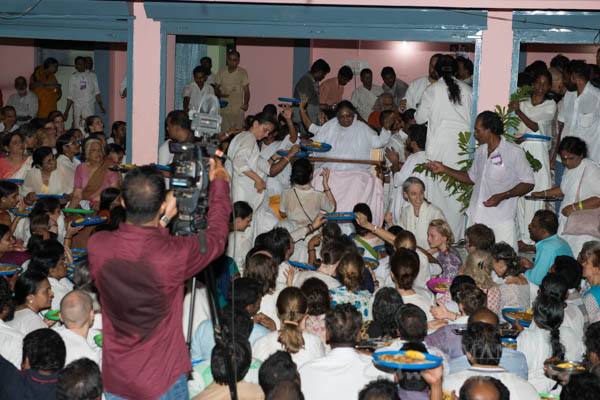 Hundreds of devotees welcomed Amma on her arrival from Amritapuri, after which Amma served a prasad dinner to one and all. 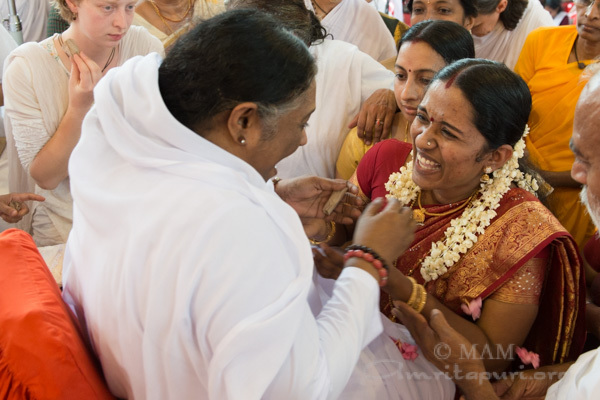 One devotee told Amma that he no longer feels as connected to Amma because in the early days when he first met Amma, five archanas were held daily. 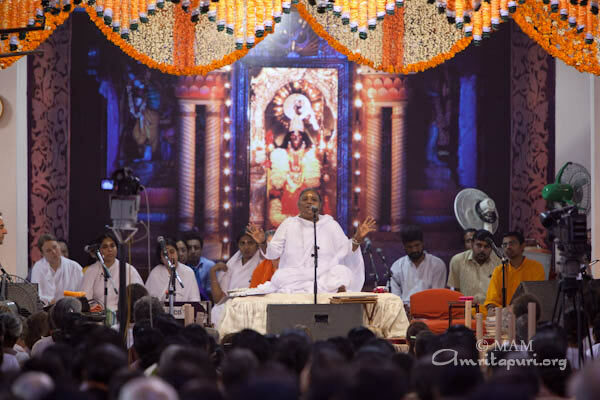 He complained that he could not relate to the newer songs and he said the old bhajans were better. 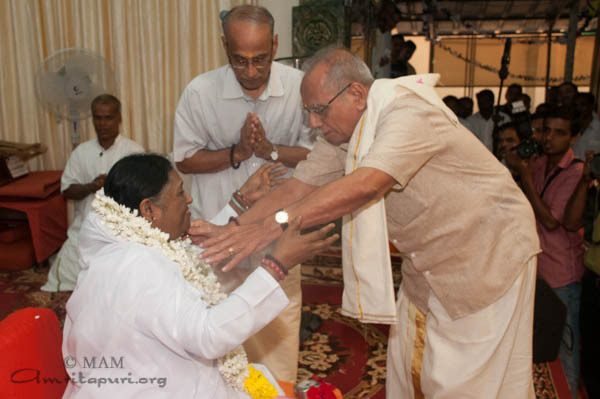 Amma replied that he has lost the innocent devotion that he had in his early days with Amma. 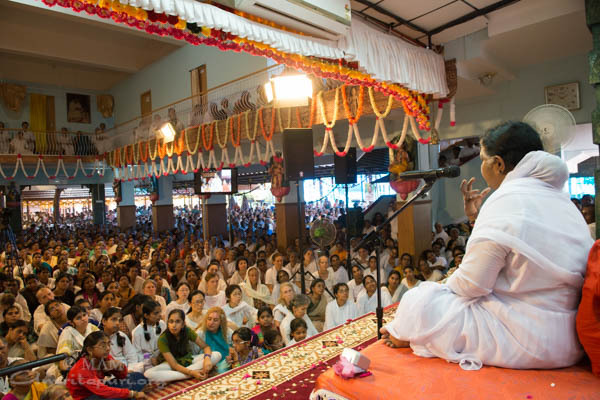 She continued by saying that on the contrary, the new bhajans have very deep meanings. It is his perspective which has changed. 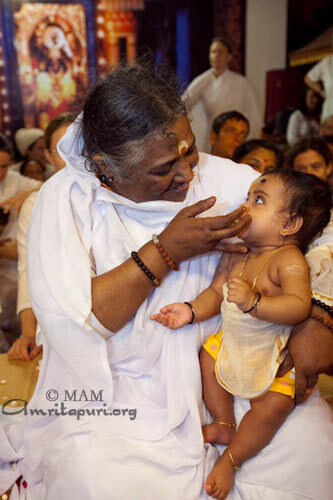 Amma reminds us again and again that we must kindle the childlike innocence in our heart. 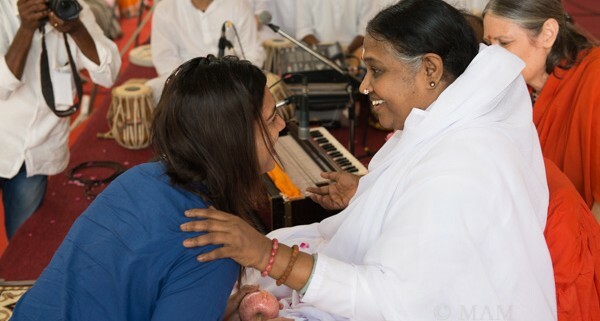 It’s important to maintain the attitude of a beginner, because, Amma says, only a beginner can learn. 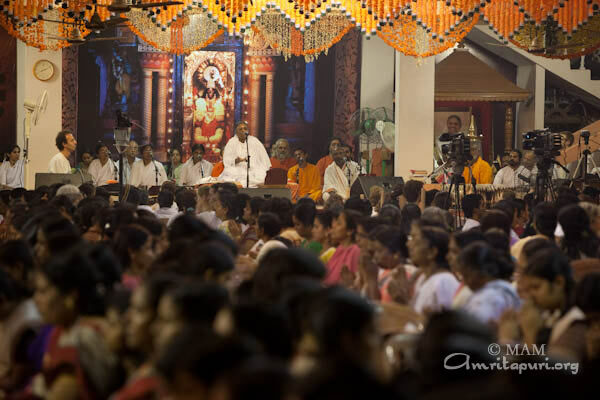 The next day, the program grounds were packed to the brim with devotees awaiting Amma. 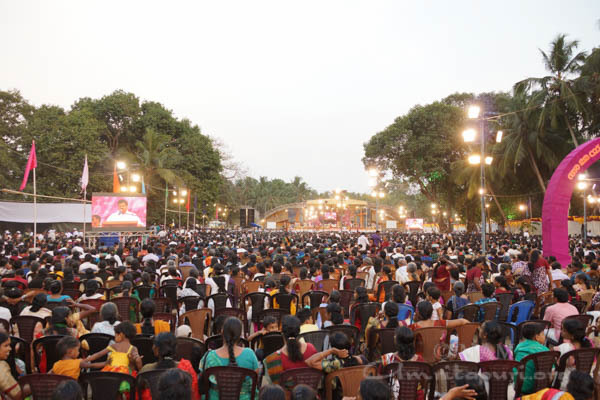 Many invited guests attended in honor of Amma; Swami Sadbhavananda of the Ramakrishna Math, Trissur, editor of Prabhuda Kerala; Bhaskaran Nair of the Kochin Devaswom Board; Shobha Surendran, member of the National BJP Council, film actress Lakshmi Priya and play back singer Gayatri. 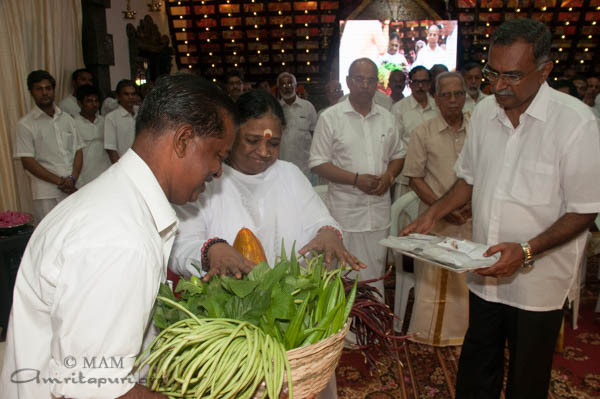 Amma has been encouraging all the devotees to grow their own pesticide-free vegetables. 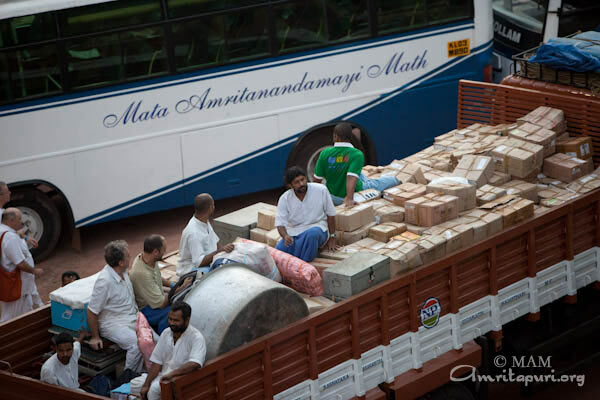 To that end, as part of the program, Amma gave organic seeds for devotees to start personal vegetable gardens. 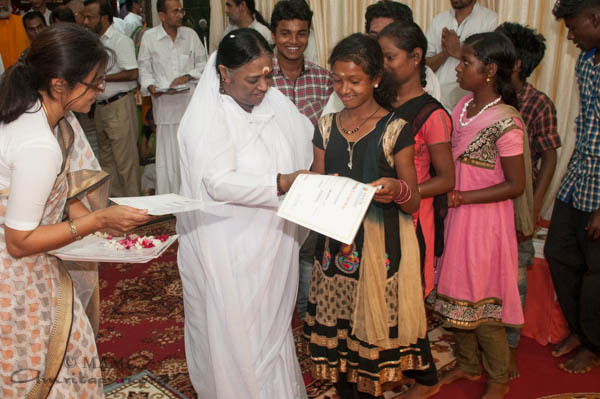 Amma also expanded the rolls of both her Amrita Nidhi pension program and Vidyamritam scholarship program. 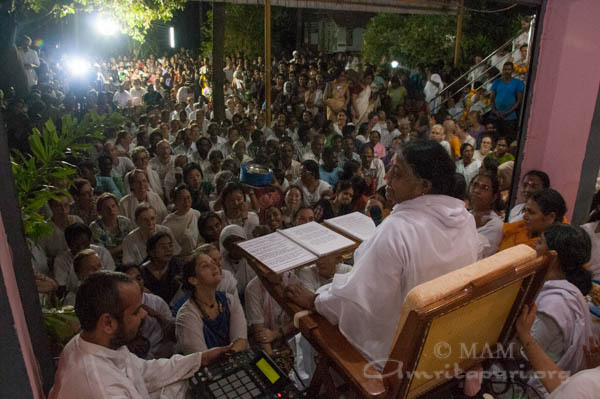 In her satsang, Amma stressed the importance of safeguarding Nature. 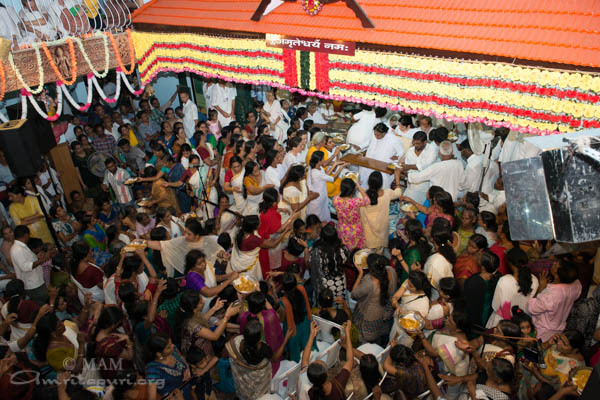 She asked the devotees to put a sapling along with the other offerings on their Vishu altar. 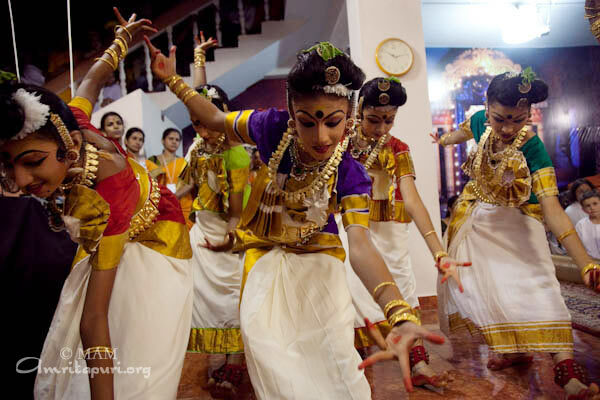 On Vishu, it is the tradition that the elders of the family give their children and grandchildren pocket money. 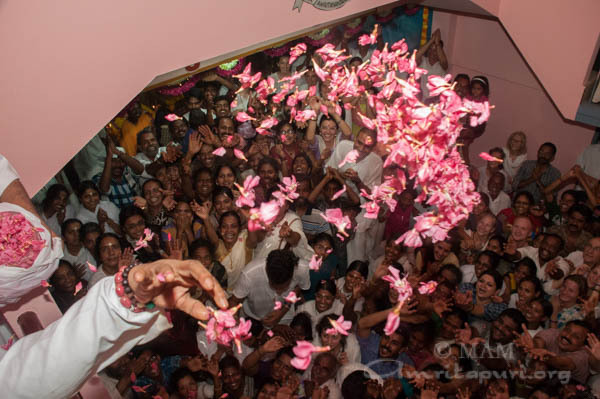 Amma said that this year, along with money, they should give the children the sapling. 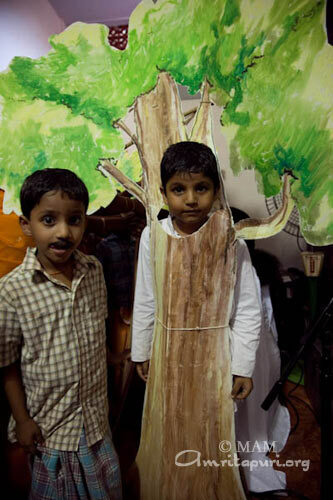 They should explain to the children how Nature must be respected and how trees are essential to human life. 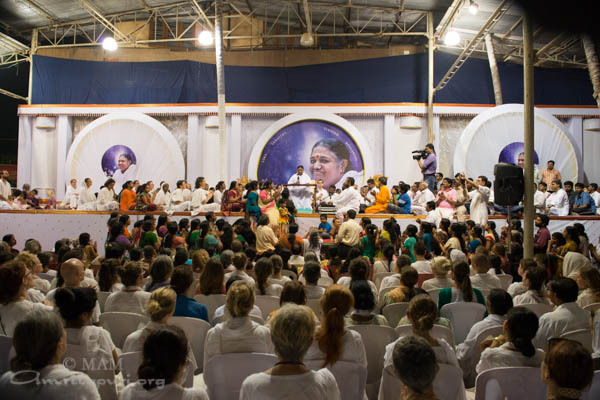 Amma stressed in both days’ satsangs the need to protect Nature and how this awareness must develop in the young or the consequences for the human race will be dire. 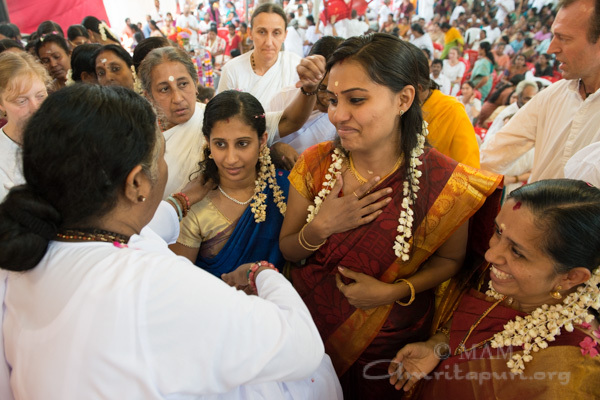 Gayatri, well known to the Keralaites, asked Amma’s permission to sing. A hush of excited anticipation filled the air. 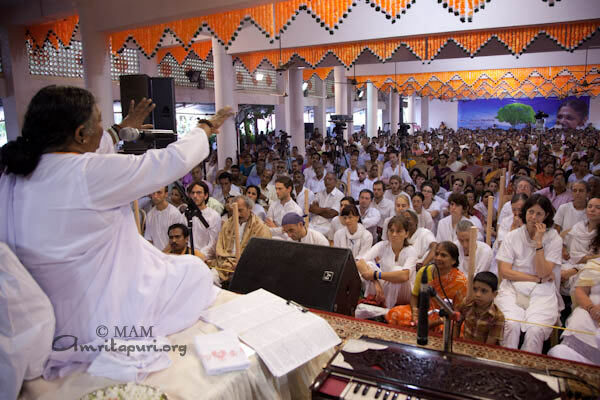 The international devotees, not familiar with the singer, were captivated by Gayatri’s sweet voice. Everyone was delighted by the experience. 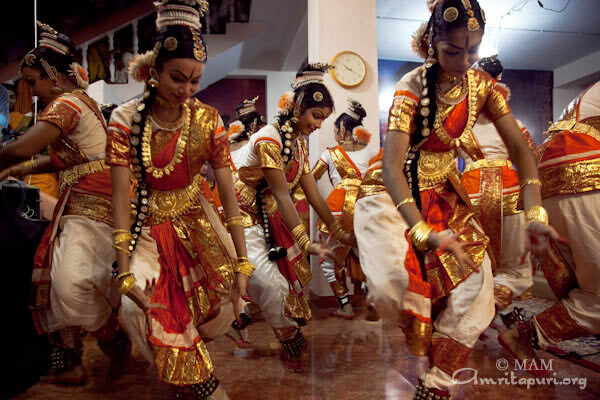 There were many dances by the students of the Kodungalloor Amrita Vidyalayam. 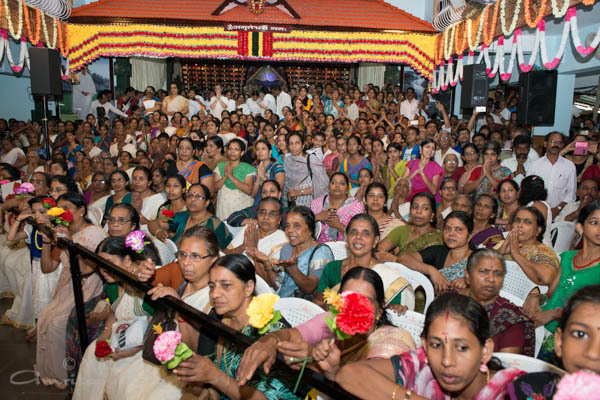 Later that night the older women devotees performed the traditional Kerala dance, ‘Tiruvatira’, in front of Amma while she was giving darshan. 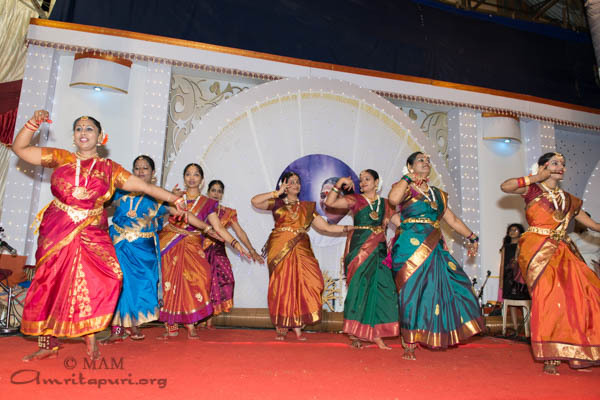 Amma expressed her happiness that the devotees are maintaining their unique cultural heritage through dance and music. 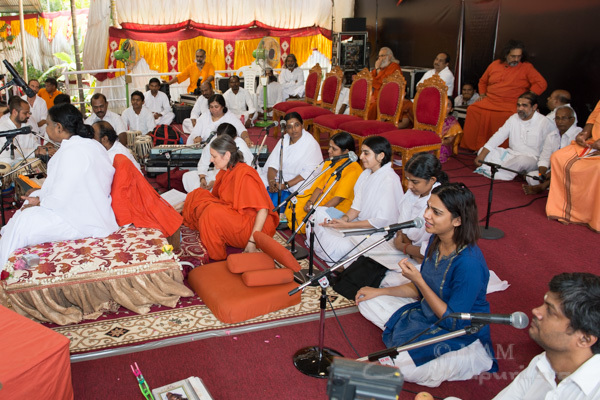 At the end of the last darshan, Amma led an ecstatic and uplifting bhajan session. 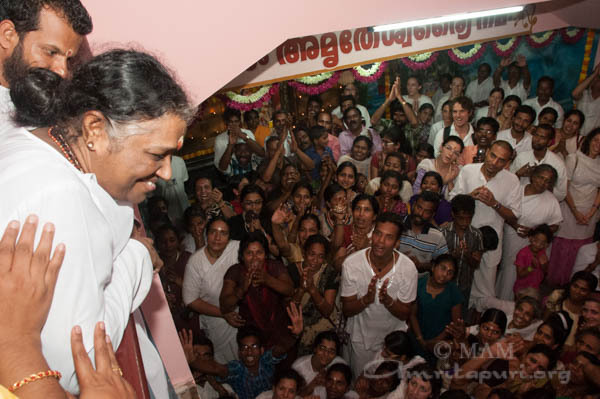 The devotees were smiling in bliss as Amma left the stage at the conclusion of the Kodangalloor program. 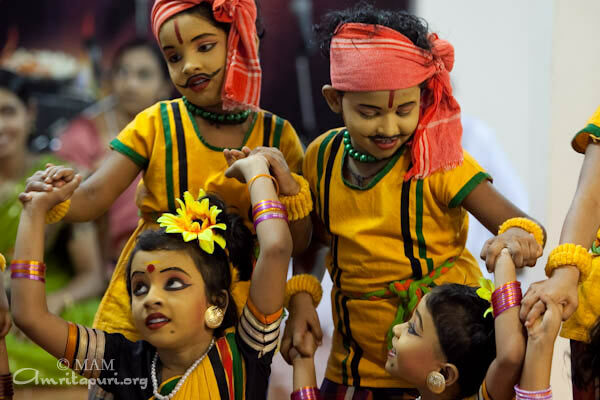 The faces of all present were shining with innocent love. 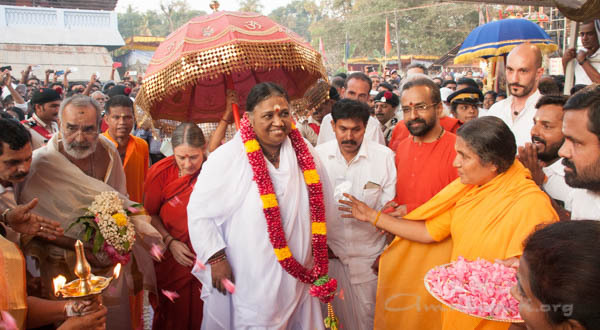 Amma arrived in Talassery the evening of February 9th, to conduct the annual Brahmasthanam festival. 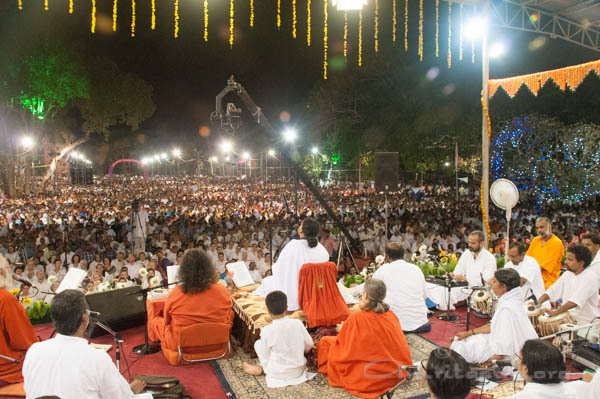 As usual, Amma gave Satsang and sang bhajans in both the morning and evening programs. 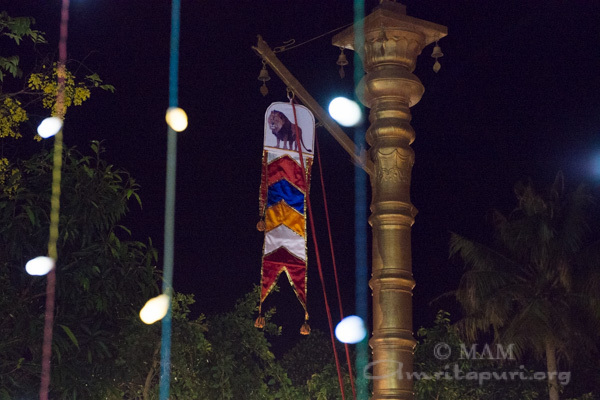 The stage background was decorated with a colorful photo of the Kali, ‘Bhavatarini’, as seen at the Amritapuri temple. 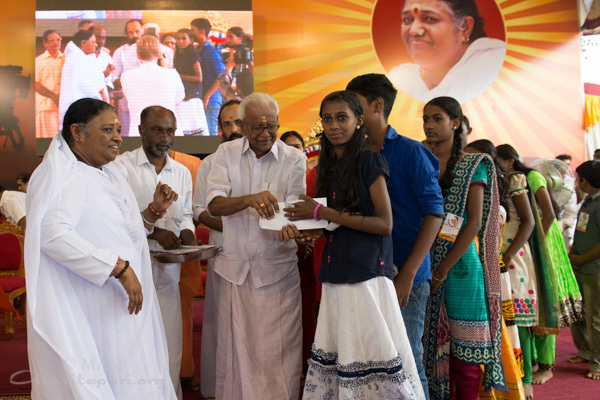 Scholarships for children were also distributed by Amma, as part of the ‘Vidyamritam’ free educational scholarship scheme. 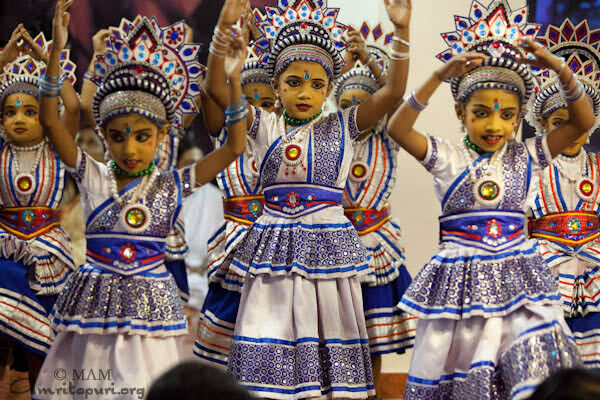 Children from Amma’s schools, ‘Amrita Vidyalayam’, came from five different cities and offered cultural performances. 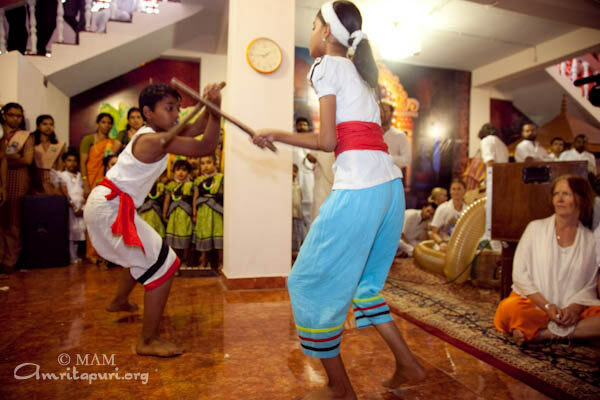 The main performances included martial arts shows, traditional and modern dancing, and dramas. 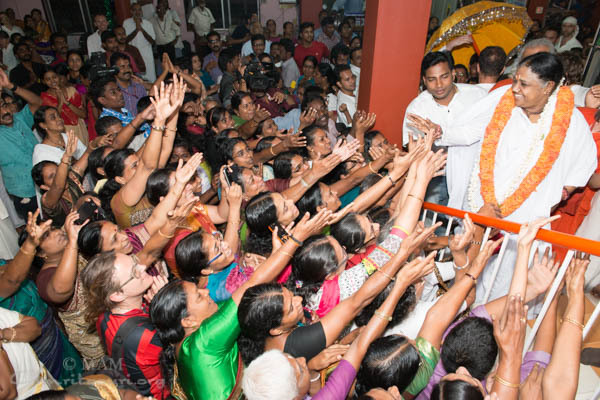 Many people who came to the program at Talaserry have been devotees for many years. 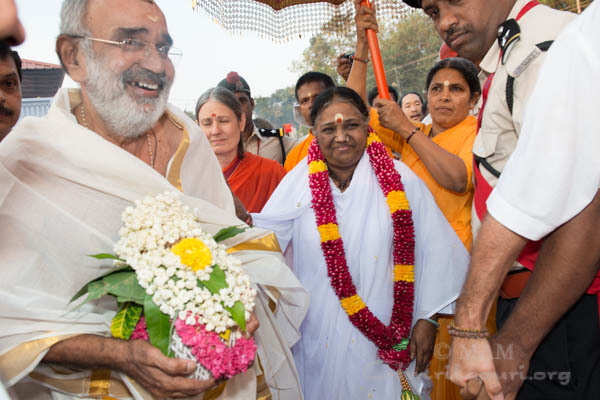 The brahmasthanam temple was consecrated by Amma herself in 1999. 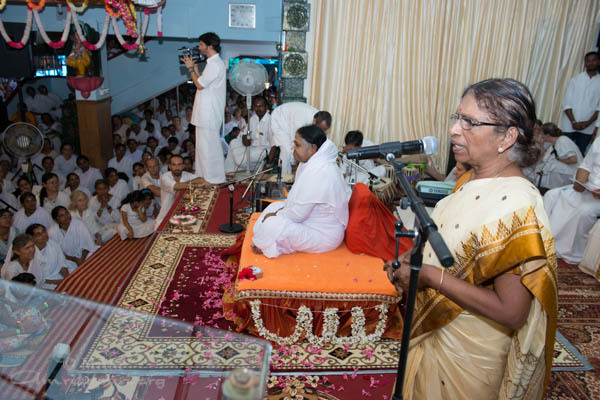 Amma has been giving programs here since 1985. 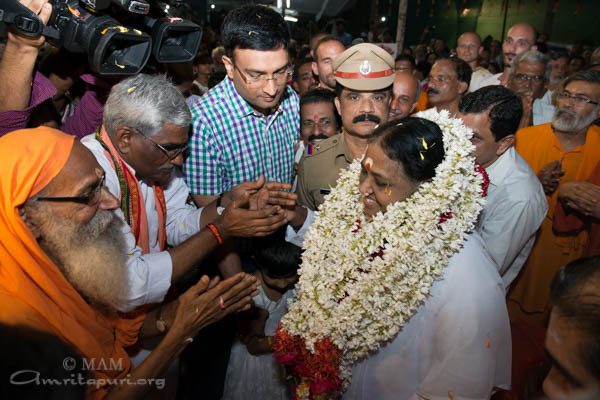 As darshan ended, around 4’o clock in the morning, standing near her darshan seat, Amma sang the Punjabi bhajan ‘Mata Rani’. 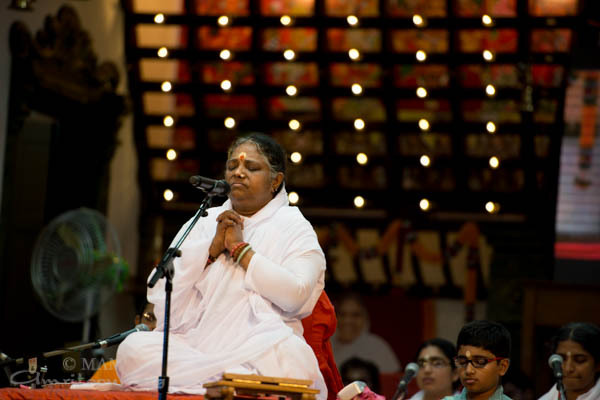 Commemorating the day of the Shivaratri, Amma sang another song ‘Bolo bolo sab mil bolo Om Namah Sivaya’. 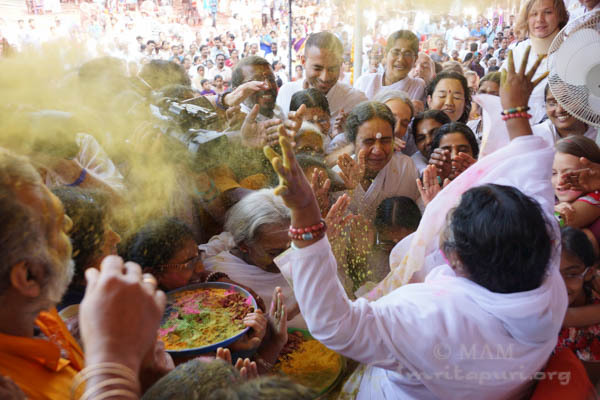 For about half an hour, as Amma sang, the whole crowd became jubilant and joined in this special celebration. 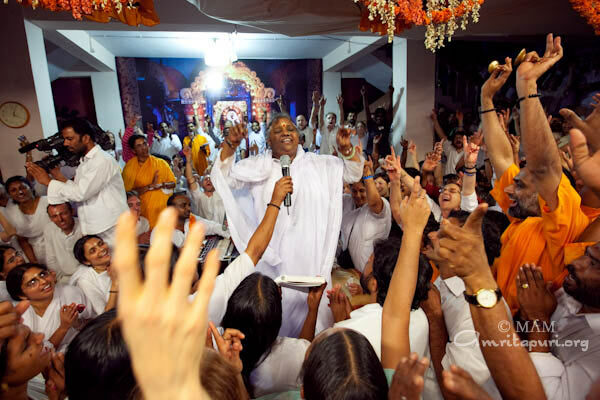 To most there, it was a celebration with that True Auspiciousness that is known as Shiva. 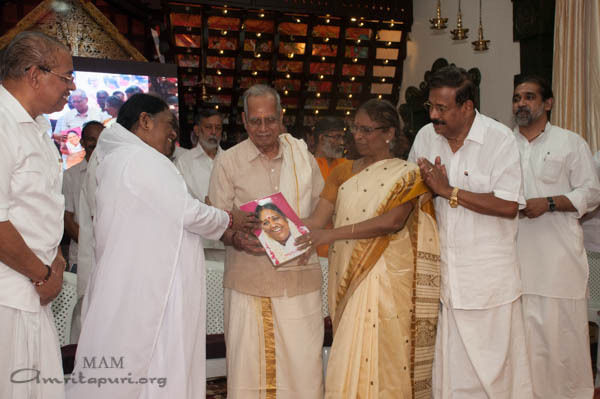 An AIDS Hospice was inaugurated during the Amritavarsham50 Celebrations at Kochi by Mr.Murali Manohar Joshi, Hon. Union Minister for Human Resource Development. 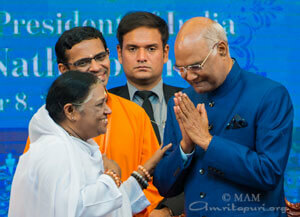 Sri T.N.Chathurvedi, His Excellency the Governor of Karnataka and Smt. K.R. Gouri, Minister of Agriculture, Govt. of Kerala, were also present. Dr. Joshi also mentioned the various services rendered by the M.A.Math, providing all basic necessities for the needy, covering health, housing, hunger and education. 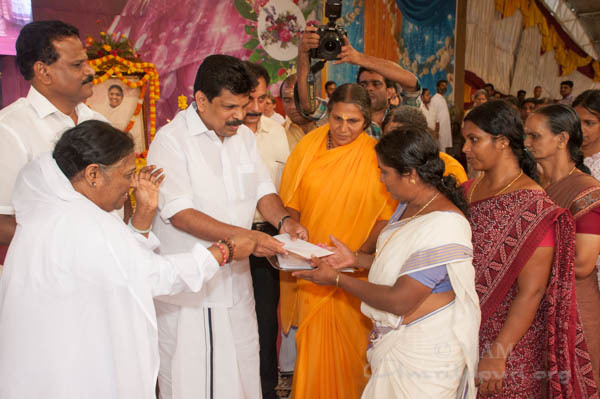 “While the governments lag behind in providing these facilities, Amma has worked wonders. 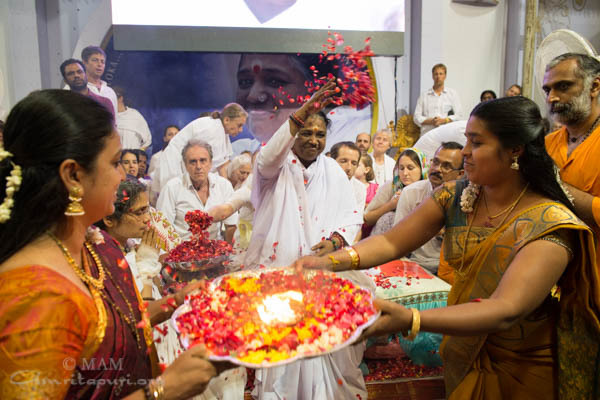 Amma’s service to the entire humanity is fast expanding, and is wholehearted and selfless. She expects nothing in return. 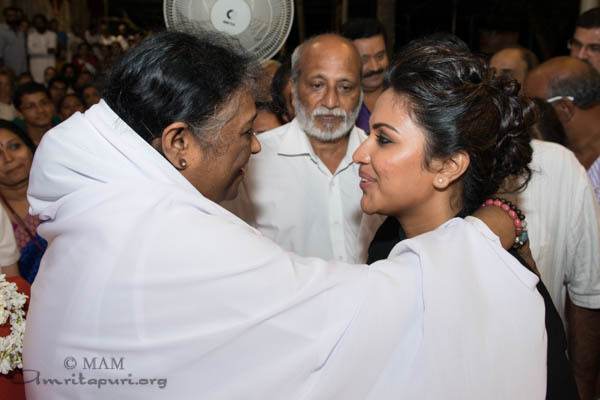 Divinity Herself has come to help humanity. 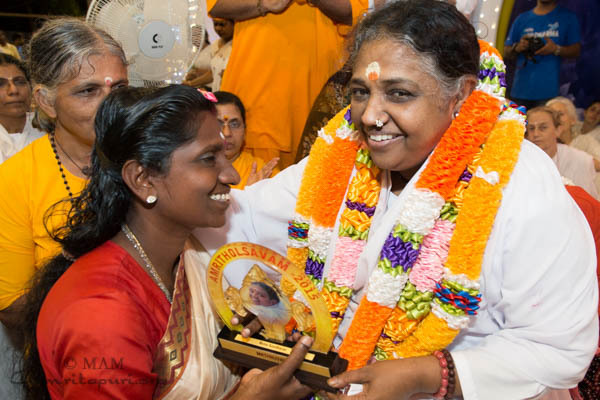 With the starting of this hospice, She has taken care of AIDS patients, and now She is worried about the trafficking of women and children.” He concluded his speech by saying that Amma is determined to remove all forms of suffering. The AIDS Hospice is functioning at Thiruvananthapuram, Kerala.